The standard Single Piece Masonry Hanger is designed for building into brickwork or blockwork. As standard all hangers are manufactured from 2.0mm thick pre-galvanised steel to BS EN 10346 : 2009, DX51D + G600 compliant with BS6178: Part 1:1990 and to the requirements of BS5268. Wide top flange design offers increased loading capacity on masonry with a minimum crushing strength of 2.8N/mm2 and above. 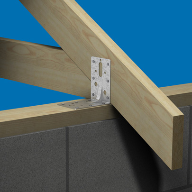 Hangers 150mm deep and over are manufactured 10mm less to allow for notching and regularisation of timber joists. All hangers feature 75mm bearing surface and pre-punched side gussets to allow nail fixing into timber joists with 30 x 3.75mm sherardized square twist nails. Special masonry hangers can be manufactured to suit applications where unusually heavy loads occur. Available in galvanised or stainless steel heavy gauge plate, to customer drawings. The return type hanger is designed for similar application to the Type S but with the advantage of a return flange (25mm as standard ) which greatly increases lateral support by giving the top flange additional resistance to pull out. 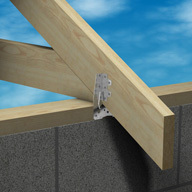 We would recommend the use of TYPE R return flange hangers wherever possible for all timber to brick applications. As standard all hangers are manufactured from 2.0mm thick pre-galvanised steel to BS EN 10346 : 2009, DX51D + G600 compliant with BS6178: Part 1:1990 and to the requirements of BS5268. Wide top flange design offers increased loading capacity on masonry with a minimum crushing strength of 2.8N/mm2 and above. 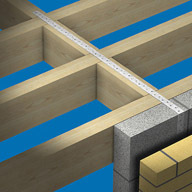 Hangers 150mm deep and over are manufactured 10mm less to allow for notching and regularisation of timber joists. All hangers feature 75mm bearing surface and pre-punched side gussets to allow nail fixing into timber joists with 30 x 3.75mm sherardized square twist nails. 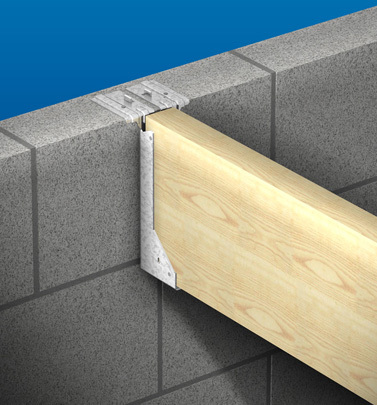 The straddle type joist hanger is used when timber joist positions are directly opposite each other on either side of a wall or beam. 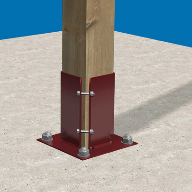 As standard the straddle hanger is manufactured to suit 100mm blockwork , however any width is available to order. As standard all hangers are manufactured from 2.0mm thick pre-galvanised steel to BS EN 10346 : 2009, DX51D + G600 compliant with BS6178: Part 1:1990 and to the requirements of BS5268. Wide top flange design offers increased loading capacity on masonry with a minimum crushing strength of 2.8N/mm2 and above. 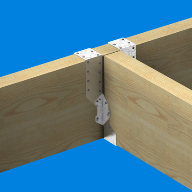 Hangers 150mm deep and over are manufactured 10mm less to allow for notching and regularisation of timber joists. All hangers feature 75mm bearing surface and pre-punched side gussets to allow nail fixing into timber joists with 30 x 3.75mm sherardized square twist nails.